I thought I better post this now because I’m on another losing streak. I’ve been stuck in the 45.0-46.5% “wins” plateau for months, but briefly set a new record. 4/17/2008: It took me all this time to get back to the old record. You can see it took a number of additinal games, too. 6/7/08: Incremental gains. A new record, hard-won by a very small margin! 6/11/08: The audacity of hope. Chance of busting 47%: slim. Chance of backsliding: do the numbers. 6/14/08: The audacity of hope. I did it. 9/6/2008: like the last butterfly of Spring, you’d best get a last look. 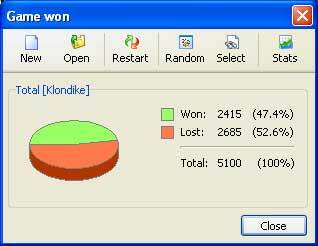 This entry was posted in Solitaire and tagged Klondike by Alex. Bookmark the permalink.